Jana Easley walked across the stage at Arizona State University's graduation ceremony earlier this month and has been accepted to the college’s master's fast track program for social work. It is an accomplishment to be proud of regardless of the circumstances, but for a high school dropout who struggled with drug addiction and abusive relationships, it is an impossible dream finally coming true. Having received her General Education Diploma in 2007 through the Adult Basic Education department at Tempe-based Rio Salado College, Easley credits her continued success to the encouragement she received from ABE instructors. She shares her story with the hope that others will be motivated to take the first step and enroll in GED classes. "I started my journey at a domestic violence shelter," Easley said. "At age 35, after 8 years in an abusive relationship, I was able to leave with my daughter and my life." "My addiction to meth left me homeless and living on the streets. I had already lost my son and eventually custody of my daughter was given to her father," Easley said. Easley was accepted into rehab through New Arizona Family Inc. (NAFI) and completed the program in four months. During this time, she tried to register GED classes at an institution in central Phoenix, but seats were limited and she was not accepted. After 10 months sober, Easley relapsed. "I lost everything," Easley said. "My apartment, my job, my vehicle, and I lost my daughter again." "After a two and a half year relapse and many near death experiences, I was able to get sober again by the grace of god," Easley said. "I went back into the rooms of Alcoholics Anonymous and Crystal Meth Anonymous, got a sponsor and started working the 12 steps." "For the first year of sobriety I worked at Kashman's Catering in Scottsdale. They gave me my first raise ever and invited me to the company Christmas party," Easley said. "It was reassuring. I was building self-confidence and was ready to tackle the GED again." "I had heard through the grapevine that if I put a certain amount of hours in on my GED from Rio Salado College, they would pay for my first three classes at any Maricopa County Community College," Easley said. "That's what I needed to hear. I was 'all in'." At 40 years of age, Easley cut her hours to part time and returned to the classroom. "I spent many hours with Suzy, my GED teacher and mentor," Easley said. "Suzy had so much patience and believed in me until I believed in myself. After her third attempt at the GED test, Easley received a late-night phone call from her instructor. "What a moment that was," Easley said." She was actually crying when she told me. I can still hear it: 'J you passed! You're going to graduate!' I tear-up a little when I think about it." After graduation, Easley spoke with a mentor from Rio Salado who helped her register for classes at Paradise Valley Community College. "Rio kept their word and paid for my first three classes. I was really impressed," Easley said. "I started in the summer of 2007, by fall I entered as a full-time student and graduated in May of 2010 with my Associate degree and an acceptance letter from ASU." 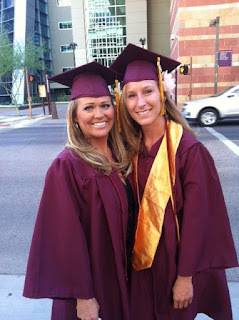 Easley followed the example set by Rio Salado alumni who occasionally stopped by her GED class. "I intended to get my bachelor's right from the start because that's what was modeled by prior students at Rio," Easley said. "They would tell us to get our GED and keep going, so that's what I'm doing!" Easley will start a fast track program in the summer of 2013 and should earn her master's in social work by 2014. "I celebrated six years of sobriety on March 11," Easley said. "I'm currently interning for the National Council on Alcohol and Drug Dependence for women. I want to work with women suffering from substance abuse; either one-on-one or in a group setting." Easley said she hopes her story will encourage others to go back to school and change their own lives. "Thinking about it could last a lifetime," Easley said. "Just do it! If one can believe, one can achieve." Article published in the Tempe Republic May 26.